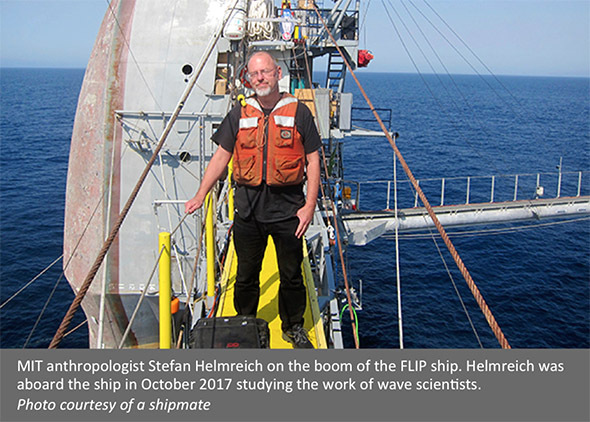 As part of his ongoing research on how scientists think about the world, Helmreich wanted to know: What are the changing theories, models, and technologies that physical oceanographers use to apprehend and understand waves? The author of the award-winning book Alien Ocean: Anthropological Voyages in Microbial Seas, MIT anthropologist Stefan Helmreich has a wealth of experience examining how scientists think about the world. 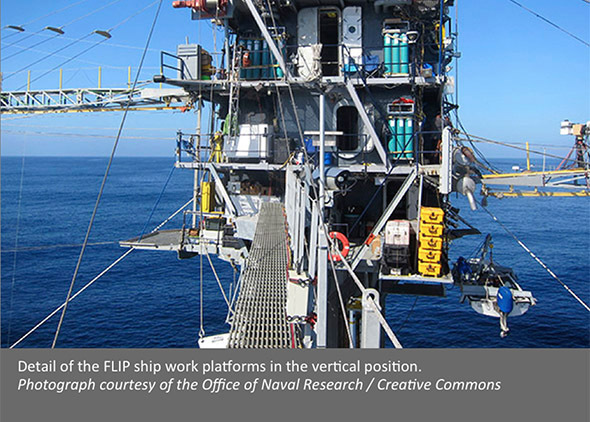 And recently, he gained a new perspective — quite literally — by taking his research to the Floating Instrument Platform — known colloquially as the FLIP ship. 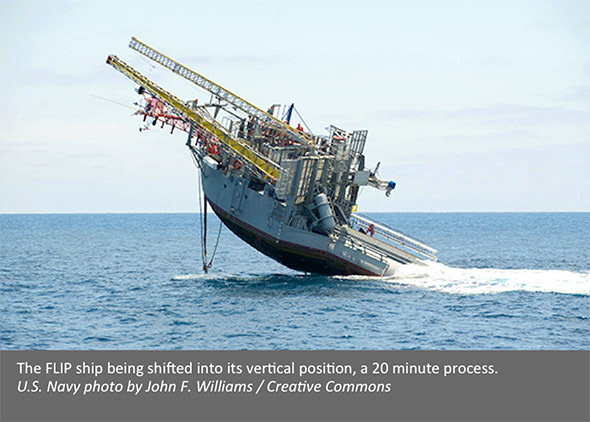 Operated by the Scripps Institution of Oceanography in La Jolla, California, the FLIP ship is a unique scientific vessel that can operate in either a horizontal or vertical position. “Everyday life on the ship has an M.C. Escher sort of feel, with doors, sinks, and stairs appearing in both vertical and horizontal alignments,” says Helmreich, who is the Elting E. Morison Professor of Anthropology and head of MIT Anthropology within the School of Humanities, Arts, and Social Sciences. Within this framing, a range of questions become available, from "How have scientists come to think of ocean waves as populations and statistical processes?" to "How do mathematical conceptualizations of waves relate to the everyday vocabularies of seafarers, shipbuilders, and surfers?" 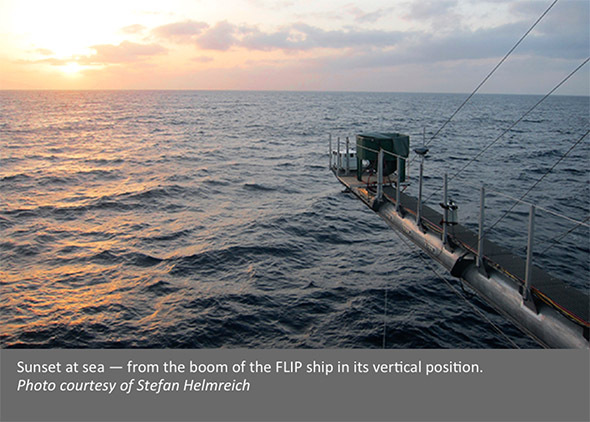 “In this position, the vessel looks like nothing so much as a floating metal treehouse,” Helmreich says. 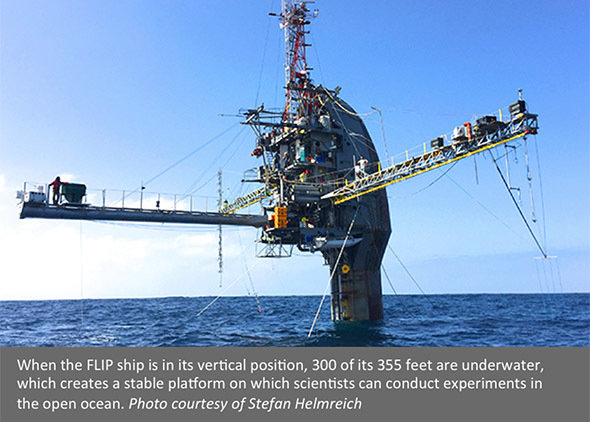 With most of the platform's 108-meter length below the surface, scientists have the rare opportunity to work on the open ocean in a remarkably stable environment. 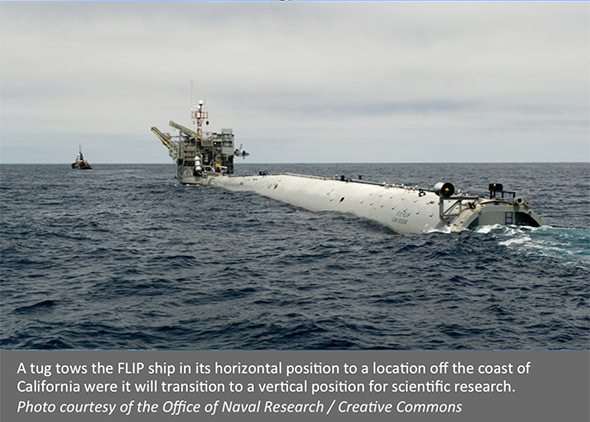 FLIP has been a significant instrument in the long history of US-based wave science, permitting scientists to investigate underwater acoustics, to capture the varied spectrum of ocean waves, and much else. Helmreich emphasizes that waves are not just physical phenomena; they are entities that become scientifically legible through measurement, models, and theories — that is, through human cultural activity. Back on land, Helmreich continues to extend his research on waves to a wide range of disparate phenomena that employ the same abstract concept. Drawing on media theory and sound studies, for example, he has lately asked, in an essay in The Wire, how we should understand the sounds of gravitational wave detection (a related article in Cultural Anthropology drew on interviews with MIT physicists Nergis Mavalvala, Scott Hughes, and David Kaiser), and in an article in Current Anthropology, how medical measures of cardiac waves have changed health care. In a recent essay in Women's Studies Quarterly, a feminist studies journal, Helmreich also explores how ocean waves have been described with gendered symbolism in mythology, literature, and social theory. "An orienting note: waves are tricky to think about. Waves are not merely material processes of energy propagation or of vibration. They are also abstractions crafted by scientists who decide what will count as wave activity, whether in a passive medium (as with water waves, sound waves), an excitable medium (as with cardiac and brain waves), or in a vacuum (as with light waves or radio waves; Barad 2007). Literary critic Gillian Beer (1996) has examined the popular reception of wave theory in physics alongside early twentieth-century modernism, noting that both emphasized the transitory and illusory character of the apparently solid world (Beer points readers to the etheric ocean of wireless radio and to Virginia Woolf’s novel of fluid subjectivities The Waves). Beer suggests that the electromagnetic “wave” enters the modernist world as a token of a self-conscious relativism about representational schemes. This doubleness is still with us today. Waves are at once processes as well as traces of those processes — traces inscribed in graphs or charts and, less obviously, in the very model of waves that is bound up with their observation."